Ruthven Mansions have had a colourful history. Among the earliest of Australia’s multi-storey apartments, they were built in two stages (1911-12 and circa 1914). The property was sold in 1954 to the state government and rapidly fell into disrepair. By 1976 the buildings had been shorn of their distinctive balconettes, the interior had been declared unsafe, and the Chest Clinic that had occupied the ground floor had moved to new premises. After lengthy negotiations, the buildings were renovated internally and partially rebuilt externally to resemble the originals. Their remarkable change in circumstances coincides with a fall in the city population during the earlier part of this century, followed by a renewed interest in city living in the 1970s generated during the first five years of the Council’s City of Adelaide Plan. The mansions are historically important because they represented a benchmark in providing luxury accommodation in Australia. They featured central vacuum cleaning, automated doors, mechanical ventilation, electric light and an electric lift. They are now greatly subdivided and refurbished, and few of their original internal details remain. They were originally built for Ruthven Frederic Ruthven-Smith, whose name is also associated with a development of semi-detached and detached cottages grouped around Ruthven Avenue off Grote Street. Stage one of the mansions originally consisted of 12 large apartments. The prominent Kyffin Thomas family (of Register newspaper fame) lived in one of them. It was also the address of W.A. Webb, Commissioner of Railways. Such residents showed the desirability of these apartments for prominent Adelaide families. The mansions were designed by architects Black and Fuller and built by A.R. Maddern and Son. Stage two of five storeys was built by W.C. Torode and consisted of about 28 flats, the facades to Pulteney and Austin streets continuing the design of the earlier four-storey section to the south. 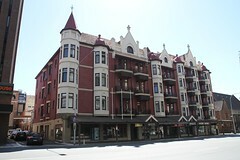 The design, strongly residential in character, is a distinctive interpretation of the Gothic and Art Nouveau styles unique in South Australia. The complex is one of the most successful recycling projects in the city. Advertiser, 8 June 1976, 21 April 1978 (article by John Chappel); Beck, E., Adelaide architecture 1903-27, pp. 8-9; MLSA, Historical photographs (Town Acre 24). Something to add or share?